With a year to go until the next election, the fall sitting comes during a busy time for politics in the territory. CBC North's N.W.T Legislature reporter Alex Brockman breaks down some of the main issues heading into session. 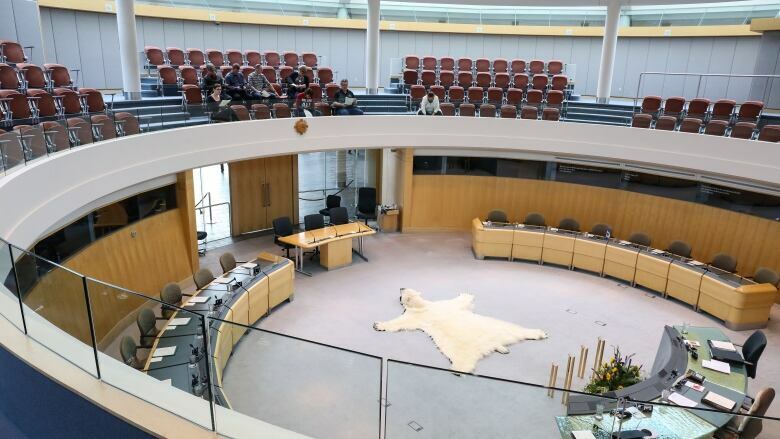 The fall session of the Northwest Territories Legislative Assembly begins this week, and there's a lot of unresolved business for MLAs leftover from the spring. With a year to go until the next election, the fall sitting comes during a busy time for politics in the territory. While MLAs debate at the legislature over the next three weeks, the territory's municipalities are holding their elections on Monday, Oct. 15. Marijuana becomes legal in Canada two days later, on Oct. 17. On that day, the government officially enters the marijuana business — handling the supply of legal cannabis across the territory. To get ready for the next few weeks of action, here's a look at some of the ongoing storylines to watch as the session starts today. Finance Minister Robert C. McLeod and other territorial government officials released the final details of the N.W.T. 's marijuana policy on Wednesday, but expect regular MLAs to continue bringing this up in the Legislative Assembly. MLAs and residents now have details on price (between $8.21 and $14.55 per gram), where cannabis will be sold (at every liquor store except the Inuvik location and downtown Yellowknife) and how they can buy it online (through the N.W.T. Liquor and Cannabis Commission's website). But the government has not yet released numbers on how much this will cost, something it had promised earlier in the year. Expect regular MLAs to dig into this over the next few weeks, looking at how the government is going to track how successfully it transfers from prohibition to becoming the supplier of all legal recreational cannabis in the territory. The territorial governmentfleshed out the details of its carbon pricing plan this July, meaning this upcoming session will be the first chance for MLAs to question the government about it. The debate happens as a growing number of provinces defy the federal government's plan to put a price on carbon across the country. The premiers of Saskatchewan, Alberta, Manitoba and Ontario oppose the national carbon plan. The N.W.T. government has never been an enthusiastic supporter of the tax and said it wants to keep the effects on businesses and the cost of living to a minimum. Kam Lake MLA Kieron Testart said the N.W.T. 's plan "has a lot of flaws" and expects there to be a healthy debate on the issue over the next few weeks. "The model that they've proposed leaves significant gaps in addressing the largest emitters of carbon in the territory," he said. "It's not a very ambitious plan and it doesn't really achieve the needs of my constituents on a family level." As it stands, the N.W.T., carbon tax will kick in next July, with most residents seeing its effects at the pump right away, with the price of gasoline going up 4.7 cents per litre and diesel jumping 5.5 cents per litre. Overall, the tax will be $20 per tonne of greenhouse gas emissions, gradually increasing to $50 per tonne in 2022. What's next for Aurora College? Meanwhile, cabinet is expected to provide its response to the foundational review of Aurora College released this spring. That report issued 67 recommendations for changing the school into a polytechnic university, headquartered in Yellowknife. That recommendation set off a firestorm in Fort Smith, where the college is currently based. How the government responds may be a nagging issue for cabinet this session, especially after Yellowknife Centre MLA Julie Green released a copy of a separate review into the college's social work diploma program on Tuesday. The report recommends that Aurora College develop a bachelor of social work program similar to the one offered at Yukon College. It was completed in April, but it took an access to information request from Green to have it made public. Green says she hasn't heard a commitment from the government that it will follow those recommendations, but she'll press for an answer during question period over the next few weeks.